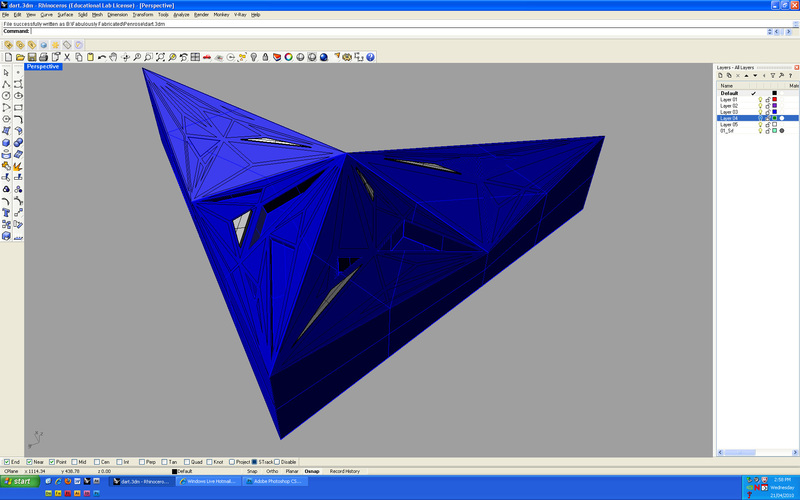 After deciding to use the ‘cracking’ technique, we downloaded the script into Rhino. We then created a set of curves that mimicked the shape of the kite and dart tiles and began using the script to break the triangles within these shapes into smaller triangles. 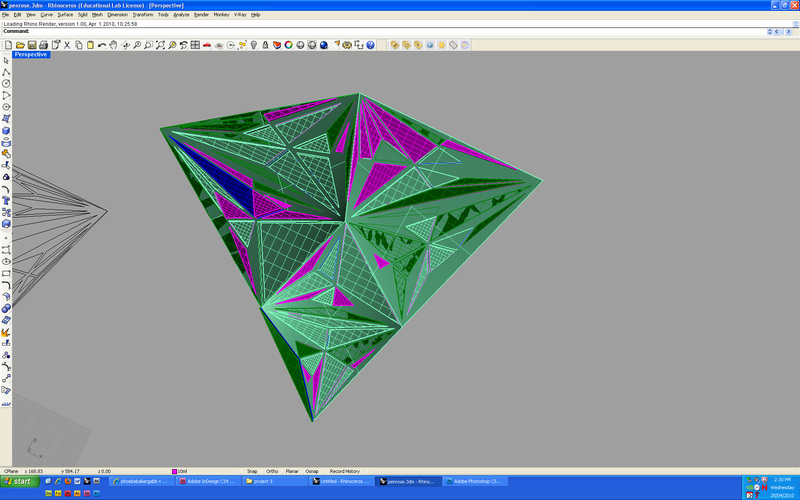 We varied the amount we ‘cracked’ areas, making some quite dense and other with only sparse, large triangles. 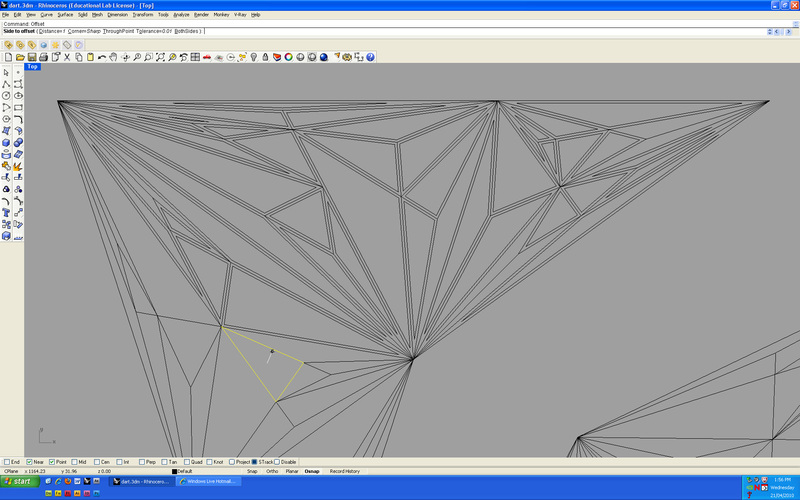 Once we were happy with our shape we offset our triangles using an offset values differing between 1-3mm. 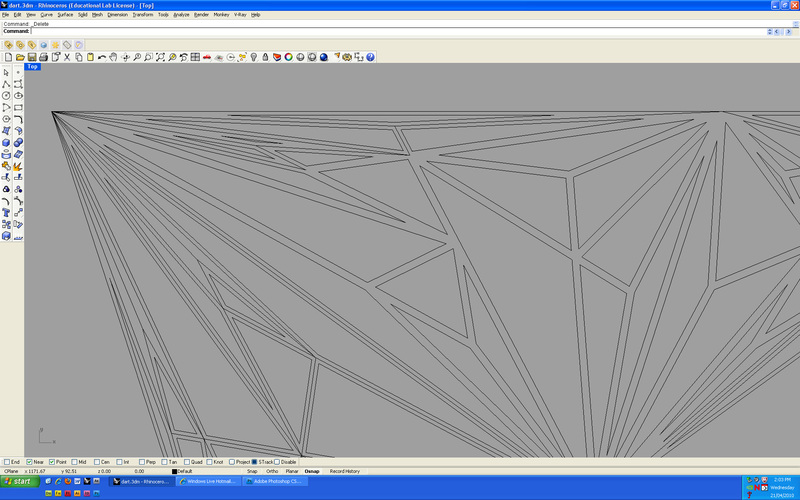 We then deleted variety of orignal and offset curves to create a more dynamic pattern. Our design was projected onto the tiles, however due to the geometry of the tile we were unable to simply extrude the curves and had to change them into surfaces using the ‘patch’ tool. We were then able to extrude the surfaces up and down. 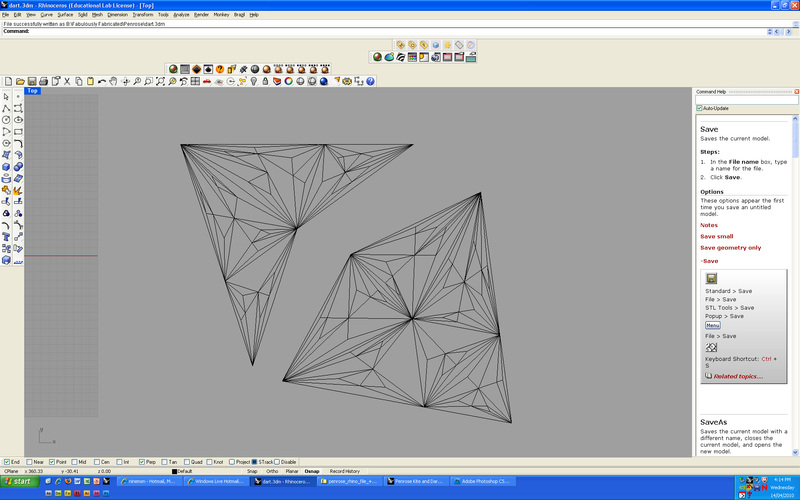 We used the Boolean difference tool to cut out our extruded shapes and leave us with a clean surface to give to Andrew. Something we had to take into account when offsetting our shapes, was that the router bit can only create details as small as 3mm. 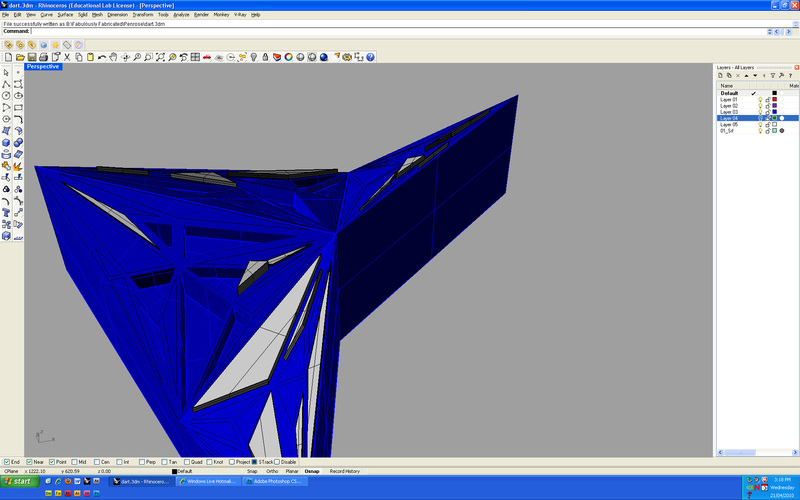 This means that all corners of our shapes would not be as perfect as on the screen. We decided that we would incorporate this as a part of our design. 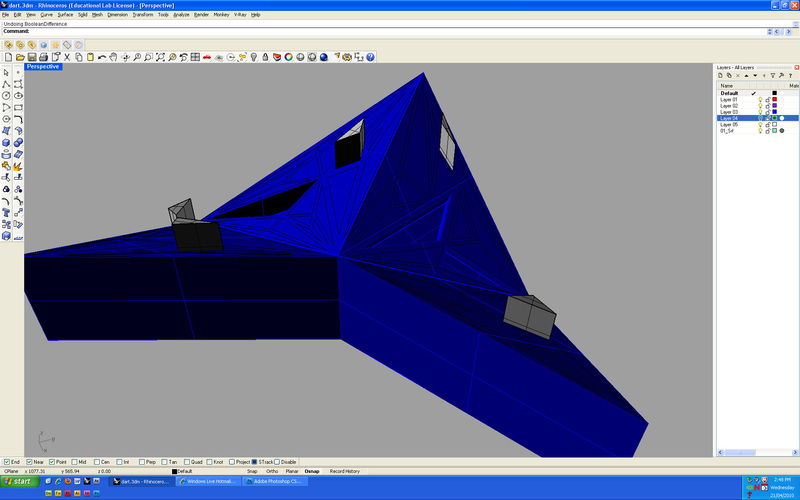 We also decided that to create contrast between rounded and pointed edges, we would extrude some of the shapes up instead of just simply down as this allows the router to cut out the points as seen on the computer screen in Rhino. During our meeting Andrew showed us a variety of tools that would help us achieve the smoothest possible finish for our tile.